Humility and Simplicity: Like St. Francis of Assisi, St. Anthony was born into a rich family that expected great things from him. From an early age, he was drawn to living simply in the spirit of the evangelical counsels: poverty, chastity, and obedience. Fortunately for us, he disappointed his family by joining a local monastery of Canons Regular on the outskirts of Lisbon in Portugal. Some years after entering the monastery, he met five Franciscan Friars who came to his monastery one evening en route to Morocco. He was greatly moved by their way of living poverty. Shortly after, he heard of their martyrdom in Morocco, and he was inspired to join this new band of poor friars, the Franciscans. Throughout his life as a Franciscan friar, he shared St. Francis’ love for simplicity of life and service of the poorest. For many of us, we live in a Western society that is in many ways similar to that of St, Anthony’s pre-monastic life: all the comforts; more food than we can ever eat, making our careers as our life’s goal, and so on. It takes someone who is reflective to realize that they no longer have time for prayer, for quality time with family and friends, or even for personal growth. By the example of his life, St. Anthony reminds us that we don’t need all these things; we want them because we are told by society that we need them. To be happy, we really only need to have authentic relationships with God and our neighbours. The Study of Theology: As part of his training as a Canon Regular, St. Anthony was sent to study theology. Later on, when he was already a Franciscan Friar, his superior discovered his great theological understanding and his exceptional gift for preaching. Therefore he put St. Anthony to work as a “full-time preacher”. To this day in the Franciscan world, St. Anthony is known for this gift of his that is preaching. He not only had the gift to understand Scriptures; he had a tremendous gift of making Scriptures understandable for others, thus touching their hearts with his words. As it was with St. Anthony, so it should be for us. It is true that we are not all theologians, nor do we all have the opportunity to preach, for that matter. The invitation here is to go deeper in our knowledge of our faith because we don’t know when we will be asked by someone to explain something that pertains to our faith. St. Anthony’s talent was also discovered by accident: one day, a group of Dominicans came to the Franciscan friary, and it so happened that no one was prepared to preach. The Franciscans thought that the Dominicans would preach – as they were known for their good preaching – while the Dominicans assumed that the hosts would do the preaching. The superior, out of desperation, chose St. Anthony to preach. Our lives are not so different. Do we know when we will have to speak on behalf of our faith? Even if such opportunities do not come up, we should nevertheless strive to get to know our faith. How spiritually impoverished many Catholics are today because they know nothing about what they believe. How much more alive would their spiritual lives be if they delved deeper into the mysteries of the faith! Never give up: A final point of inspiration is St. Anthony’s persistence to preach the Gospel. Though a gifted preacher, he was not always welcomed by towns and villages because of their sinful way of life. Despite the unwelcome, he did not give up. 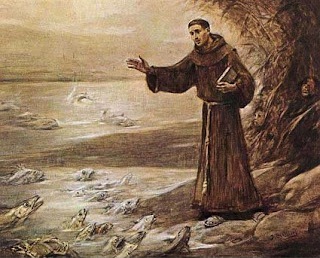 On one occasion after being turned away by a village, St. Anthony went to the sea and started to preach the Good News to the marine creatures. Fish started to surface near where he was standing and miraculously gathered close by to hear his words. Some people saw this and went back to the village to report the miracle, and he was welcomed back soon after. We can imagine that St. Anthony would have had his hands full today as well; it is perhaps unsurprising how similar today’s problems are to his times. As it was for St. Anthony, our work in the Church is not always smooth sailing. We may encounter opposition and at times persecution for working for the sake of the Gospel. Or, we don’t see any fruits of our labours. These may be temptations for us to give up or to lose hope. Let us not fall into desolation and into the temptation from the devil to give up! Though we don’t see the fruits now, this does not mean that the seed will not germinate and grow some years down the road! In this respect, we need to trust in the Lord to work on peoples’ hearts – we can only do so much; after that, it is up to God. Great post. It is for articles like this that I'm getting hooked onto this "Ibo" blog. Blaze down the trail, Jesuits! I find what you said in this article about the study of Theology and about preaching very down to earth. And yes, never give up, never lose heart. The seeds you sow will germinate somewhere, sometime - the good Lord will not let them fall on the wayside wasted.